Today is a big day for me and LTM, my blog turns two years old. I can’t believe I have nearly blogged everyday for two whole years straight. It’s been the most amazing experience of my life and I feel apart of something a lot bigger than just writing. The blogosphere has been so supportive and good to me I couldn’t thank everyone enough for stopping by, always encouraging me and amazing continual support. So like I did last year, I have to say a huge thank you to all my readers. You give me so much by reading my blog so I am here to return the favor and give you all a chance to WIN something amazing everyday this week. 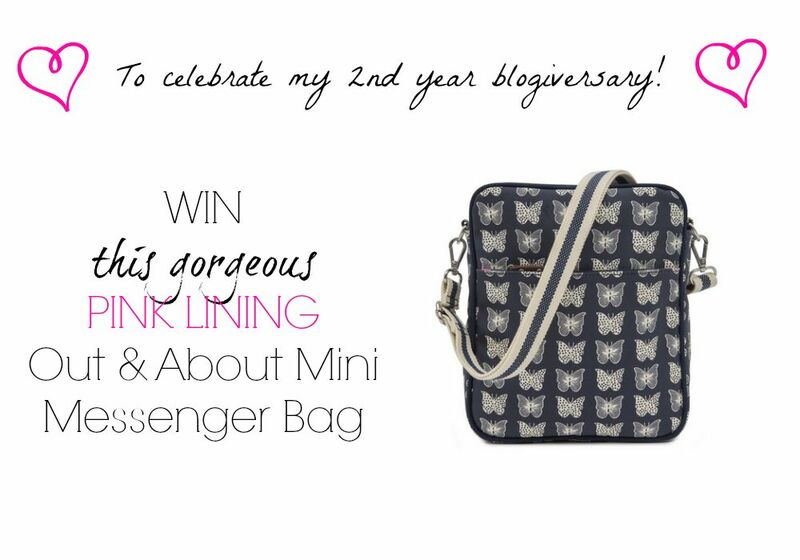 I am kicking off my blog birthday (blogiversary) with the chance to WIN this absolutely gorgeous Pink Lining Out and About Mini Messenger bag with butterflies in Navy. It’s the perfect bag to have at your side for those easy to reach items you frequently need: keys, wallet, phone, tissues, lipstick, etc. You don’t have to be a mommy either that’s what I love about the Pink Lining designs you can use their bags for any occasion long after the kids grow up or if you don’t have any children. I think this messenger bag would be the best travel bag. It could easily hold all your must haves like a passport and currency safely close to you. Doesn’t every traveler needs one of those. Enter below! Don’t forget to tweet daily for extra entries and share with your friends. It would be a great Christmas gift for someone, it’s only 110 days left. Yes, I am counting! Best of luck. Thank you all for your continual support. Happy Happy Blogaversary, thanks for the chance to win a prize because of it!! Happy Blogiversary, and thank you for the lovely competition. Thank you ever so much Jennifer it’s been a learning curve but made into something so much bigger for me than I thought possible. I love it all. Thanks Michelle, it’s been such a great journey. Happy blog birthday! Great bag! Oh that would be a lovely bonus to your gorgeous baby boy’s arrival no doubt. Best of luck hunny, and thanks for stopping by. Thanks for stopping by Emma and entering. Hope to see you again soon. Good luck Julie and have a lovely weekend. Thanks Alica, it’s been a lovely two years of learning and working hard. Ahhh thank you ever so much. I hope many many more to come. Happy blogaversary. What a lovely prize, and as most of my wardrobe is navy, it would go perfectly. Oh that’s fantastic and good luck. Pink Lining is a great brand and quality too so it would be perfect for everyday. I love their bags. Thanks for stopping by lovely. Thank you Kat. Hope you had a lovely weekend and thanks for stopping by. Happy blogaversary Jenny. I love this bag!! Thanks for entering and stopping by. Hi, is this open internationally? Yes, please enter and thanks for stopping by LTM. Hope to see you again soon. Thanks for the amazing competition! Best of luck to win and thanks for stopping by LTM. Hope to see you soon. Happy Blogaversary! So glad that this is open internationally because this bag is adorable-thank you! Thank you hunny and best of luck to win. Thank you so much darling for your amazing continual support of me and my blog. You are a star. Oh Nicola that is the nicest thing anyone has ever said to me. You just made my day hunny. I appreciate your time and comments and support SO VERY MUCH. Congratulations on your Blogiversary ! Happy blogversary -Thank you for the fabulous giveaway. Fab fab fab. Great blog and great giveaway! Happy Blogaversary and hope you enjoyed the blog awards event 😀 Love this bag! I am enjoying your blog. Thank you. Happy bloggaversary, you should be keeping this bag for yourself!! !